Ricki Heller, PhD, RHN, is an award-winning blogger, educator, recipe developer, and the author of Naturally Sweet & Gluten-Free. An associate editor for Simply Gluten-Free magazine, she lives in Ontario. Visit her online at rickiheller.com. Please listen to earlier interviews with Ricki Heller. Hello everybody, I’m Caryn Hartglass and you’re listening to It’s All About Food. We are live. Live here on Progressive Radio Network today on February 24, 2015 and we’re feeling alive. We’re freezing feeling alive, aren’t we here on the East Coast. It’s crazy here and looking forward to some changes. I’m really glad to be here and I want to shout out to the great staff at Progressive Radio Network. We’ve having some challenges and moving and we’re still here. We’re still here. I want to bring on my guest today. Ricki Heller, PhD, RHN and award-winning blogger, educator, recipe-developer and the author of Naturally Sweet and Gluten-Free and associate editor for Simply Gluten Free Magazine. She lives in Ontario, where it’s also very cold. And you can find her at rickiheller.com. She’s got a new book. We’re going to be talking a bit about that. A lot about it, actually. Living Candida-Free. Ricki, how are you doing today? Ricki Heller: I’m good, how are you? I’m glad we managed this. Caryn Hartglass: I know, me too. I’m really glad. You just never know with anything. You can never be certain of anything. Caryn Hartglass: And you know, that’s a good way to live your life. Never expect anything, you’ll never be disappointed. Ricki Heller: That is true, that is true. Caryn Hartglass: And then you always end up with some fun surprises like doing this program today which I wasn’t sure was going to happen but now it’s happening so let’s celebrate and make the most of it. Caryn Hartglass: So tell me how cold is it in Toronto? Ricki Heller: We have broken so many records. Ricki Heller: I beg your pardon? Ricki Heller: Oh thank you. Yeah, see, there you go, it’s looking at the positive. I think apparently we just broke a 143-year record I heard or something like that for coldest February. It’s the first February where we’ve never gone above zero, which is above freezing in Celsius. So like nothing above 32 I guess Fahrenheit? Caryn Hartglass: Wow. And how do you stay light and humorous? During this period. Ricki Heller: What alternative do you have? I was just telling someone how I’m getting used to wearing two pairs of pants, 4 sweaters, 2 pairs of gloves, a hat with the earmuffs on top of it. It’s just crazy, just to walk my dog. It takes me longer to get dressed than we’re actually walking. Ricki Heller: You know I don’t actually, isn’t that hilarious. I do know it’s pronounced differently though if you’re talking to an alternative practitioner or an allopathic practitioner. Caryn Hartglass: Oh, how do we say it? Ricki Heller: So we say, in the alternative holistic world, we say “Can-dee–da”. But if you’re talking to a conventionally trained doctor, they call it “Can-did-a”. And so, I think that’s the Latin term like Candida Albicans. So that may have something to do with it. I’ve been corrected in the past because I was pronouncing it wrong, but in fact every alternative practitioner does call it “Can-dee–da”. So even naturopaths, for some reason. I kind of like that divide because it shows that we’re actually talking about something that’s slightly different. Because in the alternative world we’re talking about this syndrome that I have been dealing with. But if you’re talking to a conventional doctor, what they mean by “Candida” is – there’s a condition called “Candidiasis” which is basically a blood infection of this function and it is literally deadly. You’d need to be treated immediately and aggressively or you’re going to die. So that may also be part of the reason why over the years conventional doctors have looked at you askance if you say “I have Candida” because they think you’d be dead. So it’s a completely different. We’re talking about something that begins in the gut and has more to do with an imbalance in the gut and they’re talking about an actual blood-born disease. Caryn Hartglass: Wow. You say “Can-dee–da” and I say “Can-did-a”. “Can-dee–da”, “Can-did-a”. Let’s call the whole thing off. Well, now that’s part of the frustration and the challenge that so many people have who have what we’re going to call Candida. “Candida” – I just want to keep singing it, it’s such a melodic kind of word. I don’t have the same feeling about it as you do, so you probably don’t want to sing about it. Ricki Heller: Well, maybe now. Not at the beginning for sure. Caryn Hartglass: And as you said doctors, conventional, traditional doctors don’t even acknowledge its existence, although I want to say that maybe more and more they are. Because they are learning from the alternative practitioners. Ricki Heller: And I think yes. I really think the situation is changing. We’re sort of in transition now because this whole branch of functional medicine, which is much more prevalent in the US than it is here in Canada, although there are some functional doctors here, but very few and far between. But you have the branch of functional medicine that is now really like an integrative, complementary way of looking at the body and health and so they’re acknowledging Candida and also using established scientific methods at the same time so I think brings a whole new realm of credibility to this. Because if someone like Mark Hyman or Andrew Weil are looking at this and saying, “Yeah, it exists” then the rest of the world is going to start to take note too. Caryn Hartglass: So if you have Candida, what are you experiencing? Ricki Heller: All kinds of fun things. This is one of those conditions where it can actually spread to so many different systems in the body that the symptoms can be far-ranging. And initially what you’re going to get are certain symptoms and as it gets worse it will spread to other systems so. Initially if you have really intense sugar cravings, that really feel beyond normal sugar cravings would be, that’s completely out of control, that’s a really tip-off and also people often begin with all kinds of digestive distress so my first symptom years before I was diagnosed with Candida was IBS. First I was told that I had IBS because they couldn’t figure out what was wrong with me and then that then become Candida overgrowth over time where it might be just a sign that you’re starting to have Candida overgrowth. And then because Candida is a yeast or a fungus, all of these conditions that are connected to fungi, so yeast infections for women, jock itch for men. Things like athlete’s foot or fungal toenail or fingernail infections. And then what was my major symptom in 2009 when I was diagnosed for the second time was a fungal rash or Candida rash, which just looks like a regular rash except that it’s a little bit worse than your average rash because it’s really red, really raw and both itchy and painful at the same time. At least it was for me. But really really itchy so that can be…. and it spreads like crazy if you don’t get it under control. That is another symptom that a lot of people get. And then from there, if it gets worse and it’s not addressed you might end up with other symptoms and some people have other symptoms before they get these, but for me those were the ones that sort of started things off. Caryn Hartglass: I’m sure conventional medicine just wants to throw medication when you have a rash like you experienced. Ricki Heller: I put every cream known to humankind on that rash and I was prescribed every cream known to humankind. I saw 7 dermatologists and they gave me literally all of the anti-fungal creams they had and nothing worked. Nothing. Caryn Hartglass: I’m getting the feeling as we’re learning more about the microscopic land in our bodies and we’re learning about bacteria and bugs and all those little tiny things that it’s going to open the door to a lot of good healing for things that have different names, but are probably similar in origin and just differing symptoms. Ricki Heller: I think that’s absolutely true. The more we learn. Even like my IBS. Certainly IBS is still a diagnosis but someone might have connected it more quickly to Candida if we knew then sort of what we know now. You hear a lot of talk about “leaky-gut syndrome” and how that’s often connected to Candida so the micro-biome or the inner ecology that you were talking about is so important and I think we’re just beginning to learn how important it is to keep that equilibrium inside our intestinal tract and how so many of us have an imbalance. Just based on the lifestyle we’ve been living. Without even doing anything that we would consider abnormal or wrong or extreme. Just the average lifestyle that we live now in North America can contribute to that kind of imbalance. It’s crazy. Caryn Hartglass: It’s crazy… I just feel like singing today. Ricki Heller: It’s a great way to keep a good mood in this weather for sure. Caryn Hartglass: Stay tuned for more tunes. You do a lot of explaining in the beginning of your book. That’s good so that people have a better feeling about Candida and our whole digestive process and things can really go awry in so many different places in our digestive tract. And one thing’s connected to the next. Caryn Hartglass: Make friends with your microorganisms. Ricki Heller: Yeah, because think about that, they keep you running smoothly. Caryn Hartglass: I was spinning through this as you were chatting. And I lost my place. Oh, I know what I wanted to ask you. Can you explain what a functional nutritionist is? Ricki Heller: Here in Canada, we call it holistic nutritionist, as they are very very similar. So she takes a functional approach. She looks at the function of each organism, each system and tries to connect that to what might be going wrong. So it’s a much more holistic and it’s definitely an alternative approach. But she uses the scientific evidence to come to those conclusions. So the way I sort of summarize what she does is she takes a scientific approach to diagnosis and then a holistic approach to treatment for the most part. But it’s rooted in the science. So she’ll do a blood analysis and based on those results she will always first attempt to treat with the most natural therapies. Ricki Heller: Me too, I really do. I wish we had more of that here in Canada. Caryn Hartglass: I don’t like going to doctors but, I like occasionally getting the diagnosis, getting the data. Then deciding what to do about it. Ricki Heller: Exactly. And you want someone who knows what will work and who can assess your individual situation which is what functional medicine does too. They take it on a case-by-case basis. I always say, one of the things they say in the book too, is it always used to surprise me when let’s say my husband is 6’1″ and I’m 5’4″. If we both go to the doctor for a sinus infection, we’re going to get the same anti-biotic in the same dosage for the same amount of time. To me, that never made sense. He’s got way more body mass than I do. You would think that they would adjust the dosage, accordingly. But they don’t. So what functional medicine does is they really do look at each person individually and even if you have the same diagnosis, you may end up with a different treatment based on how you ended up with that diagnosis. Caryn Hartglass: I like it, because it makes each one of us feel special. Ricki Heller: Yeah, and we should feel special. Because we are. Caryn Hartglass: Yes, we should all have individual treatment. Now, once you have Candida, do you always have it? Ricki Heller: Well, I guess that depends on what you mean. Do you always have the symptoms and always suffer from it? No, absolutely not. You can definitely recover from Candida. I’ve come to believe that it depends very much on the severity of the situation when you begin to treat it and how long you’ve let it go before you began to treat it. So for instance, in my case, I really kind of waited too long to go and get treatment. So it took me much longer the second time around to get to a point where I felt healthy again and I have to be much more careful than the average person now, having had it and having gone through that because I could very easily have a relapse if I started eating sugar again or I started drinking too much wine again. Like that. So for me personally, I kind of think of it – I don’t really want to give a negative analogy- but you know the way an alcoholic is always an alcoholic, even if they’ve been sober for the rest of their life. There’s definitely something there that could be triggered in my body and in anyone who’s had a really severe case for a long time. However, at the same time, if someone has a mild case and they catch it early, I know people who’ve gone from having Candida to being completely clear of it in three months. And then they go back to their regular life and they never have to worry about it again. So again, it’s case-by-case, individual. But some people yes, some people no. Caryn Hartglass: And it’s probably something we don’t really have an understanding, clear understanding of. I’m thinking that you’ve totally changed your microbiome with your diet and you’ve got a lot of happy health-promoting bugs in your gut. But there’s probably something we don’t understand and something related to memory. I like to think that, not just the brain, but all parts of our body have memory. I don’t know how that’s stored, and how that’s triggered but stay tuned; we’ll find that out. In a few decades. 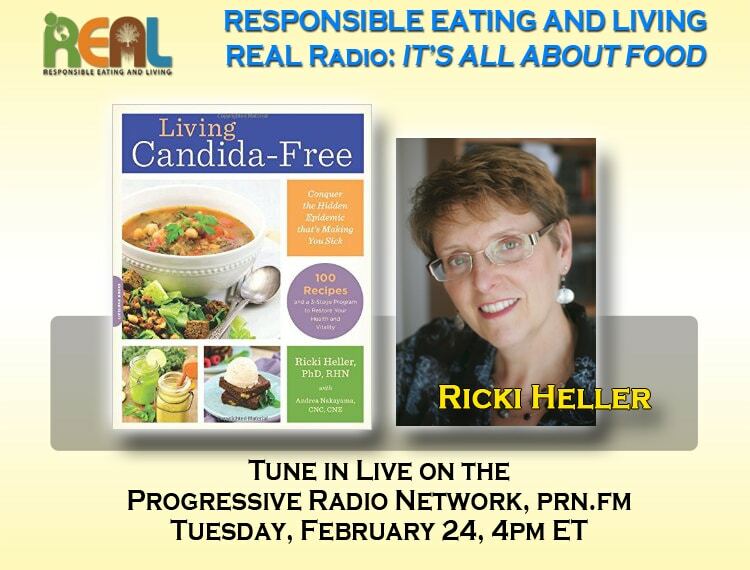 Ricki Heller: And I think part of it is you can never eradicate all of the Candida. Because you’re supposed to have some. So it’s there. It’s ready to kind of spring back into action if you’ve dealt with an overgrowth before. Caryn Hartglass: Now what are the really bad foods. What are the things that Candida love to thrive on? Ricki Heller: Favorite food, was my favorite food too – sugar. Ricki Heller: Refined sugar, refined flours, refined grains, white potatoes. Anything that’s easily converted to sugar in the body is the Number 1 food for Candida. But in terms of triggers or situations that might cause Candida to develop. Candida is the result of something that’s already happened which is and imbalance in the microbiome, so Candida itself isn’t a disease. But it’s the overgrowth of Candida that results from that. That is the problem. What can cause that overgrowth is anything that creates an imbalance to begin with. So you’ve probably heard antibiotics will wipe out of course the bad bacteria that are giving you whatever infection it is, but they will also wipe out the good bacteria that keep that gut in balance. And so a lot of people have learned that they need to take yogurt or probiotics after a course of antibiotics. But really, once that happen, I’ve read that it will take up to 3 months to replace what you lose from one 2-week course of antibiotics. So you should be taking probiotics for at least 3 months after every course of antibiotics. So once those are wiped out, then that’s a prime territory for Candida. An anything that creates that kind of upset. Anything that causes an acidic situation in the body. We go between acid and alkaline and sugar is very acid-forming in the body as is red meat, as is coffee as is alcohol, as is to me this one was the most surprising. Stress, very very acid-forming in the body. It all kind of comes together when you look back over the triggers over the years. I think – I had that, had that, check, check, check. So it’s almost as if there was no way I wasn’t going to end up with Candida. Given all of those possible triggers. Caryn Hartglass: Now. Something I like to say often is that when I restrict food from my diet, all of a sudden the world opens up and I’m eating more varied foods than ever before. I don’t know how you feel about that. Ricki Heller: I feel that’s exactly what happened to me when I went gluten-free. Because here I was thinking oh I can’t have gluten any more, it’s going to be so restrictive and what ended up happening was I found out about maybe a dozen different gluten-free grains that I never knew before. And I’ve said this before. I think I said this last time. I love baking more with gluten-free flours now than I did with regular flour because there’s so much variety and depending on your mood even. Do I feel like Teff today or do I feel like Sorghum. So there’s this vast array of possibilities. And I think that happens to a lot of people. They think they’re going to end up being more restricted but that kind of prompts them to go out and try foods that they never would have tried otherwise. Caryn Hartglass: Now you’re encouraging people to find their kitchens with this book and make a lot of things on their own, which is something I always do because it’s very important. Do you think, and then I want to get into some of these recipes because they’re stunning, and I just want to eat every page that I’m looking at right now. Because I’m hungry. Can people eat the way you’re recommending and not make food at home? Ricki Heller: Yes you can, ultimately. At the very beginning I would say that it’s probably more important to take the first few weeks and really be sure you understand the diet and you can make all those things yourself. And also because that’s going to help your body to clear out the toxins much faster, and clear out the Candida much faster. But I’m at the point now where I’m on what I call the maintenance level of Candida diet. So I go out to restaurants. My husband, before I met him, I think he lived in an apartment once for two years and used the oven once in two years. So he’s used to eating in restaurants and he loves to eat in restaurants. So we go out about once a week now. We used to go more when we were first dating, but I can eat in restaurants and what happens is you can ease up on some of those restrictions as you continue through the diet. I don’t have a problem now. I can always find something. And then I have my favorite restaurants where I can find many things and have a great variety. I’ll still go out with friends and I don’t have to ask them to go to a special restaurant for me. Because I can always find something that’s oaky within my parameters. At the beginning you do want to learn though how to make a lot of the stuff yourself, because you are healing and you can’t eat sugar and if you read labels you know that almost everything you buy or everything in a restaurant is going to contain sugar. So you really do have to be careful when you first start out. Caryn Hartglass: Labels. Don’t talk to me about labels. Later on in the program I’m going to talk about my loves or unloves or lack of love for labels because even though we read the label, there are lies in the labels that we are learning more and more about it. It’s so frightening. Which another reason why it’s so good to make food at home because you have that much more control over what’s in your food! Ricki Heller: Yeah, as much as you can. I think it’s really crucial. Caryn Hartglass: Okay, so you have basics here. And some of these basics are like basics for any cook at home, like making your own stock. Ricki Heller: Sure, yeah, anybody can do that and that’s a recipe where I actually borrowed one of the aspects of that from a Toronto area cookbook author named Maureen Gillet. She’s the first person I saw who puts a whole onion in with the skin in her broth. And it gives this beautiful color and it looks like meat stock or chicken stock and it tastes, you know you don’t taste anything different but it’s very flavorful and it works beautifully. And you don’t have to peel the onion. Caryn Hartglass: Right. If it’s organic. And I like it because it makes it easy. And tasty. Ricki Heller: And I’m all about quick and easy when it comes to cooking. As much as I can be. Caryn Hartglass: You have recipes for coconut milk and coconut butter. Using just grinding up shredded coconut. Ricki Heller: Yes. And if you’ve ever bought that delicious raw coconut butter or called coconut cream in some companies. It’s delicious, but it’s ridiculously expensive. So, again, like you were saying, you have more control. It’s also much more economical and literally if you have a high-speed blender it will take you less than 2 minutes to make that coconut butter. Caryn Hartglass: I mean this is crazy. I never realized that you could do that and I love that every time I learn one more thing from somebody that I talk to on this program. I mean it’s great because – so many reasons – there’s less packaging, it stays a long time, you can have it whenever you want. And basically the flakes, coconut, it’s just the coconut without the water. Ricki Heller: Yes. Unsweetened, dried coconut. It has to be unsweetened and it has to be fairly fresh because if it’s, you know it’s dried but if it’s been sitting in the cupboard for 6 months it gets even drier and at that point you might have to add a tablespoon of coconut oil, just to moisten it up again. Caryn Hartglass: This is very exciting! Well, everybody loves coconut milk and it’s so good for so many different things. Ricki Heller: Oh yeah, and particularly this diet because coconut is one of the superstar foods that helps to actually kill the Candida in your body. Caryn Hartglass: Now let’s talk about grains. Whole grains. Are they good? Are they not good? Ricki Heller: Yes whole grains are good. I don’t believe in demonizing whole grains. Whole grains contain all kinds of fiber and vitamins and protein and we need some carbs and these are complex carbs and they’re good for you. They don’t really spike your blood sugar levels. The only thing with the anti-Candida diet is you are asked to eat gluten free whole grains. Because so many people have problems with gluten and may not even realize it. And what you’re trying to do is limit any foods that would cause irritation to the digestive system. We keep it at gluten free grains. And I actually have just stayed on gluten free grains ever since I started eating them. I’ve never gone back even though at this point I could go back and have spelt or kamut or something like that but I just, I love the gluten free. Why mess with it if it works? Caryn Hartglass: Now someone, I forget who I was talking to and I’ve yet to try it, but making millet flour out of the millet grains and I was told it was really easy and I’ve yet to get around to doing that. Ricki Heller: I do that. Some people use their high-speed blender, I use a coffee grinder or a spice grinder and I just put it in. You know it’s small, a small amount. But if you put in a quarter of a cup of millet, you’re going to end up with close to a half a cup of flour. And that, for my purposes, you know I’ll usually use it for pancakes or something like that. That’s more than enough for what I need. But you can just do a couple of batches if you need more flour. The reason why I think that’s better is because you are starting with a whole grain that you know is still intact and it hasn’t been processed except to be dried. Whereas with flour, it’s often gone through further processing. What’s weird for me is I’ll sometimes react to millet flour, but I won’t react to millet ground up into flour. Caryn Hartglass: Because other things must have gotten mixed in to that flour. Caryn Hartglass: It’s not as fresh, either. Ricki Heller: That’s probably it exactly. Probably not as fresh. Caryn Hartglass: So I’m looking at your whole-grain waffles where you’re using raw or toasted buckwheat groats, uncooked millet and some other basic waffle ingredients. Ricki Heller: So you’re basically turning that into flour for that recipe. You’re grinding them up and turning them in to flour and then, yeah. Caryn Hartglass: Yeah, I like it. Giving me some new ideas. Ricki Heller: Good, and lot’s of desserts of course, because you know I’m a sweets-addict and that’s what got me into trouble in the first place. But these are anti-Candida desserts that will not feed the yeast. Caryn Hartglass: And that’s because for sweetener you use Stevia. Ricki Heller: Yeah, I use Stevia and I use to a very small extent, actually not in this book, since the book came out, I’ve been experimenting with Xylitol which I do quite like, but in the book it’s Stevia and in a very few instances, there are a couple of fruits that you’re allowed in the second stage of the diet. But I wanted all the recipes as much as possible to be suitable just starting out. So there are only I think like 3 recipes that are Stage 2, and everything else is suitable no matter where you are on the diet. Caryn Hartglass: So what fruits can you eat in Stage 2? Ricki Heller: You start to introduce what they call non-sweet fruits, which is an odd name, but anyway, it’s things like apples, pears. You can have berries, they’re very low glycemic. Blueberries, blackberries, raspberries. Things like that that won’t really affect blood sugar to any great extent and then by the third phase you can re-introduce almost anything except the very sweet fruits. The ones that they consider the sweetest like dried fruits are all very sweet and bananas and mangoes, those kind of really sweet ones. But again, I’m at a point where I can have those every once in a while now again. And I love them! Caryn Hartglass: I’m going to rant here a minute. I’m looking at your hummus recipe and I was on Facebook the other day and I saw a sponsored post by Sabra. It had like twenty-thousand-gazillion likes and all these people talking about their hummus and I was steaming because have you ever read the ingredients on Sabra hummus? Ricki Heller: A long time ago. Caryn Hartglass: OK, Number 1, it’s not organic, so BOO. But Number 2, other than potassium sorbate, which is a preservative that I don’t feel like eating, they use soybean oil. Ricki Heller: Oh, I bet you they’ve changed their recipe. Caryn Hartglass: Yeah, and they call it “traditional” or “classic”. And there’s nothing classic about it because hummus which came from Turkey and the Middle East where they have a lot of olive oil and not soy bean oil. Hummus doesn’t have soybean oil in it. Caryn Hartglass: And you know it’s genetically modified. Ricki Heller: Oh yeah. That’s bad. I think when they first started out, I believe that they started out… I could be wrong, but I believe they’re a Canadian company but when they were really small and just starting out I think as I recall their ingredient list was slightly different because I don’t remember those being it. Caryn Hartglass: They probably got bought by somebody else. Ricki Heller: Mine’s not traditional either, is it? Caryn Hartglass: No, but yours looks good. Yeah, we’ve done a lot of variations on hummus since, so yours has Almond Butter in it. And because we don’t really need to have a lot of oil and it’s good to have foods that have fiber in them. Fat with fiber, right? Ricki Heller: Yep, I find that it helps make it creamy. Caryn Hartglass: Yeah. And but you also include the Tahini. Caryn Hartglass: Which is an important flavor in traditional hummus. I don’t use Olive Oil in my hummus either, although I love oil, Olive Oil and I could drink it up, but I don’t. Ricki Heller: Yeah, that’s probably a good idea. Good plan. Caryn Hartglass: And right next to it is a nice raw almond veggie pate. Very good. Ricki Heller: One of my favorites too. And these are all pretty easy to make. For people who may not be used to cooking a lot. The veggie pate, you soak your almonds, rinse them, you throw everything into the food processor. You’re done. Caryn Hartglass: Now another one that I just wanted to mention and I rarely see this. I do it, but I rarely see it. You’ve got this garlicky, warm avocado sauce. Caryn Hartglass: And I love when avocado is warm. Ricki Heller: I do in sauces like that and I also use it sometimes in baking as an egg substitute, actually. But I think you make a lovely sauce and toss you pasta with it. I think it’s delicious that way. And cold. I just like it every which way. Caryn Hartglass: Oh, I love it. But I find there’s a different flavor some how that’s brought out when it’s warm. Ricki Heller: Yeah, I agree. I think it’s becoming a whole different food. Caryn Hartglass: All right so. We’re pretty much at the end and I just wanted to ask you if you have some wise words in addition to buying your book. What people who think they have Candida should be doing right now? Ricki Heller: Well, the first thing you want to do is cut out refined sugar from your diet. And I would suggest seeking, speak to a holistic nutritionist or functional nutritionist or Naturopath. I think you call it Naturopath in the States. Someone who can assess your symptoms. There are online questionnaires you can take that will help to assess your symptoms so use that and see how your score comes out. But if you do suspect, I mean you want to be working with someone who’s dealt with Candida before and can help you work through the diet. And knows which supplements you would need to take. So I would say seek out some professional help. Caryn Hartglass: Okay, well you know I think whether you think you have Candida or not, the recipes in this book are – they look delicious and they are health promoting. And just like I was saying before there are many different ailments and diseases I think that have different symptoms but probably the same original causes. And I was thinking when I was going through advances ovarian cancer about 8 years ago, I stayed away from sugar. And I was curious what you called the sweet fruits because I was eating berries but I really stayed away from anything that could feed those bad cancer cells. This book would probably help anyone going through that sort of crisis as well. Ricki Heller: Yeah, absolutely. In fact, one of the more recent theories about cancer is that it is a fungus. So, if that’s the case, then this is the ideal diet. You want a sugar-free diet for sure and a diet that’s very alkalizing and high in vegetables. Absolutely. Caryn Hartglass: Oh great! Well then maybe in a few years, you could repackage the book with a different name. Call it the Anti-Cancer Diet or something like that. Okay. Or maybe something… well anyway. It’s good, just the way it is. Ricki, thank you for joining me on It’s All About Food. Stay warm. Ricki Heller: You too, thanks a lot. Nice to talk to you again. Caryn Hartglass: Okay. Nice talking with you. There you go. That was Ricki Heller. Living Candida-Free and you can find her at rickiheller.com.